One of the perks of our new Customize Your Box feature is the ability to add more of your favorite seasonal fruits and vegetables to your deliveries. Love heirloom tomatoes? They are certainly one of our farm's and family's most beloved items - and they are currently available by the pound and the case at a special summer's-end, back-to-school price! What would you do with a bunch of heirlooms grabbed a great price? Here are two simple ways to save the taste of summer heirlooms for enjoying now and in the winter season. 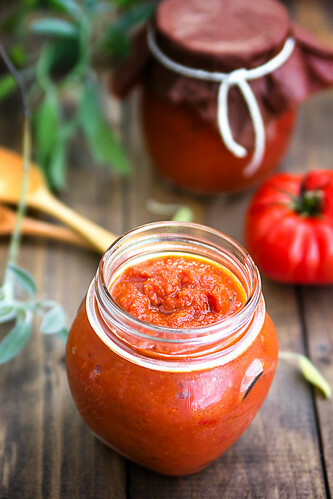 Tomato paste is a great kitchen staple, adding rich flavor to pastas, sauces, soups and much more. Why buy a can when you can easily and healthily make your own organic heirloom tomato paste? 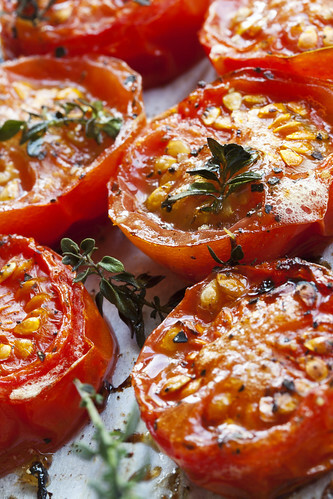 Here are two simple ways to cook down your heirlooms to concentrate and capture their flavor. A simple way to save your fresh heirlooms is to core, coarsely chop and seed your tomatoes, add a little seasoning and just keep cooking them down...and cooking them down...and cooking them down over a medium-low heat until it becomes a thick liquid/paste. Some folks swear you should oven roast your tomatoes before pureeing into a paste because baking at a low heat for several hours condenses the sweet flavor of the tomato. 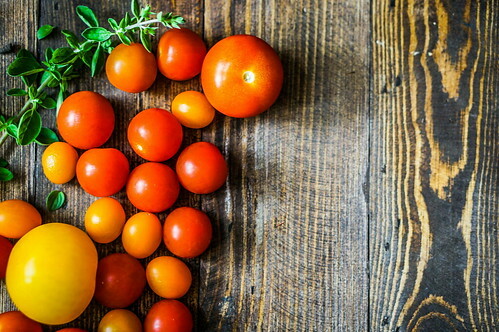 Depending on the size of your tomato, slice in half (smaller tomatoes) or into thick slices, then in half (larger tomatoes). Place cut side up on a baking sheet. Drizzle with olive oil (optional) and salt and pepper. Bake in a 200 degree F oven until dry, soft and pliable, like a raisin (this could take anywhere from 2 to 8 hours). What's next? Two more options! Well, when oven-roasted is the route you take, you may want to pull aside some of your tomato gems for enjoying now before you puree the rest for later. Keep in the refrigerator by covering them in oil for a few weeks, or in the freezer for a few months. COUS COUS - With feta cheese, oven-roasted tomatoes, kalamata olives and fresh basil. This makes for a great Meatless Monday meal. FRITATTA - Oven-roasted tomatoes add a touch of sweetness and a lovely texture to this egg dish. PASTA - Use oven-dried tomatoes as a great substitute for tomato sauce in pasta dishes. FREEZING TIP - Freeze in an ice cube tray for convenient, smaller portions. USES - Stir into pasta sauces or salad dressings. 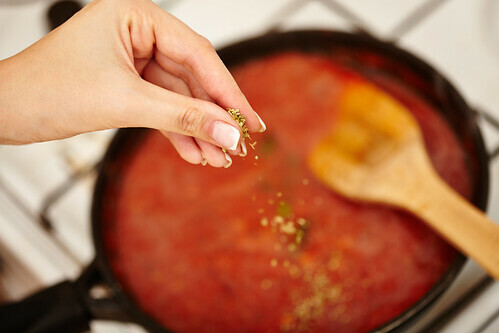 Add to soups, stews, chili, casseroles or any other dish where a tomato flavor is desired. 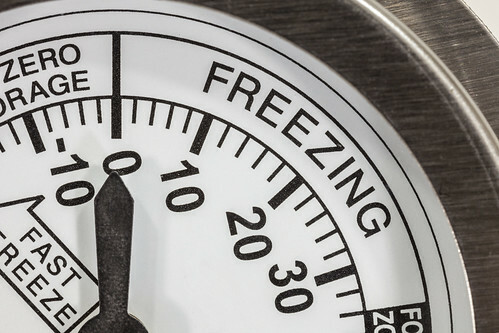 To freeze your tomatoes without turning into puree, make sure they are fully ripe and ready to eat. Remove the stem/core. To make skins easier to remove, score a line from the core, around the bottom, and back up again to the other side. In batches, add tomatoes to boiling water for about 2 minutes, then remove and transfer to a bowl of ice water. After one minute, remove and carefully remove the skins and discard. Place tomatoes on a baking sheet and put in freezer. Tomatoes can be frozen whole, chopped or sliced. Once fully frozen, transfer to a freezer-safe container. Use within 8 months for best flavor. Add tomatoes in cooked dishes as you would fresh tomatoes. Hope you head on over to our online Farm Stand Market and take your tomatoes before they are grabbed and gobbled up at such a good price. I know that's what we're doing this weekend! Remember, you can add and make changes to your box contents by 10 a.m. 2 days prior to your scheduled delivery. Not part of our farm family? Find out if we deliver to your neighborhood.